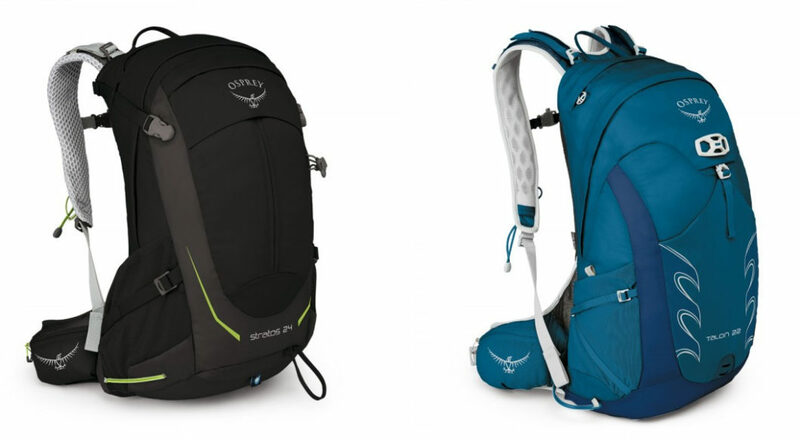 Osprey Stratos 24 vs Talon 22 Backpack Comparison which day pack is best ? A sturdy hiking backpack is an essential piece of gear when you go on a long hike. Osprey produces some of the most-recommended hiking bags, including the Stratos 24 and the Talon 22. If you are having trouble choosing between these two products, take a moment to compare their features. As with many hiking bags, the name of this bag refers to its capacity. The Stratos 24 can hold 24 liters of gear. It weighs about 2.75 pounds and has a load range of 10 to 25 pounds. This is a relatively small bag for hiking but big enough to pack enough supplies for several days. Nylon crosshatch material is used for the main body of the bag. Not only is this material lightweight but it is also durable and breathable. The harness is fully adjustable to ensure that you get a tight fit against your torso. Adjusting the bag to your body is important for keeping the bag from shifting or moving around as you hike. With a proper fit, the bag should remain stationary, limiting the stress on your back and shoulders. A sternum strap is included to keep the shoulder straps from shifting and sliding off your shoulders. The latch on the strap also doubles as an emergency whistle. This is a feature that you will find on almost all Osprey hiking bags. The bag contains multiple compartments for stowing your gear along with loops for attaching additional gear. For example, there are two loops for attaching trekking poles and another two loops for attaching ice axes. The Osprey Talon 22 is slightly smaller than the Stratos with a capacity of 22 liters. The load range is 10 to 20 pounds and the primary material is a lightweight nylon. The nylon material is not the only similarity between these two bags. The Talon 22 also features a fully adjustable harness and a sternum strap with an emergency whistle. It also includes attachment points for trekking poles and ice axes. Additional similarities to the Stratos 24 also include the side pockets for storing water bottles. To keep the water bottles from falling out the pockets, a compression strap fits over the pockets to secure the bottle. You also get a padded hip belt with its own pocket with the Talon 22 as with the Stratos 24. One of the biggest differences between these two backpacks is the size. The Stratos 24 has a total capacity of 24 liters while the Talon 22 has a 22-liter capacity. Depending on how much you need to carry, this could be an important detail to consider.The extra two liters of space also increases the recommended maximum load. The Stratos 24 has a total weight load of 25 pounds while the Talon 22 has a maximum weight load of 20 pounds. Besides the size, there are a couple more differences to consider. The Talon 22 features a mesh back panel with lots of padding. While this adds comfort, it does not provide as much ventilation as the back panel used on the Osprey Stratos 24. The next difference is the hydration sleeve. The Stratos 24 places the hydration sleeve inside the main compartment while the Talon 22 has an exterior hydration sleeve. The exterior sleeve is a little more convenient and does not take up any additional space in the main compartment. Which backpack should you choose? Both the Talon 22 and Stratos 24 are quality backpacks with wonderful features. However, there are some key differences that should help you make the right selection. The Stratos 24 provides slightly more space and weight capacity. It also features a back panel with superior ventilation to keep your back from getting too sweaty during your hike.The Talon 22 also contains a few useful features. It has an exterior hydration sleeve, allowing you to store additional items without filling the main compartment. The Talon 22 also includes a dual-zippered panel for accessing the main compartment.Both products are wonderful choices. When making your decision, consider the features that are most important to you. If you need more space, choose the Stratos 24. Otherwise, choose the bag that meets your budget or style preferences.